As a trained classical musician, I can truly say that I love the Simply Music Method and all that it allows our students to achieve. Here are some comparisons. 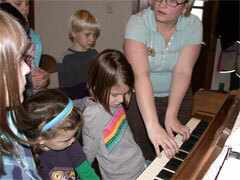 Traditional: Learn to read notes on the staff and play on the piano at the first lesson. SM: Play a song with both hands together at the first lesson. Tr: Can only play as well as you can read. SM: Can play song that you wouldn’t be able to read for at least 3 or 4 years. Tr: Songs sound very simple at the beginning. Many times even playing with just 1 hand. SM: Student sounds very accomplished in the pieces he can perform. In traditional music, it’s all about the reading and theory. In Simply Music, we do eventually learn to read, but at first, we concentrate on the playing and the actual making of the music. Most people when they begin lessons don’t say I want to learn to read music. They say I want to learn to play the piano. And that is exactly what our Simply Music program does for our students. Please let us know if you would like to talk further about our lessons. We love to talk about how playing the piano can add so much to your life and to your home!